The EMT 250 features additional outputs around the back. Try them on the UAD version for a fresh sonic character. Universal Audio offers a formidable array of plugin processors, emulating a suite of classic analogue hardware units that have won through over the years. This has allowed its UAD systems' many users to continue using this hallowed gear in virtual form, and many big-selling and highly respected productions can now claim to contain the sounds of legendary processors thanks to UA's 'Powered Plugins' platform. With these seven tips, we present a range of techniques using UAD plugins that you can draw on to elicit a classic vintage sound from your own mixes. Even if you don't use UAD plugins, these tips and tricks are easily applicable to native plugins, too, whether you're using emulations of the same gear, or adapting our advice to work with your own setup. For more on classic mixing with UAD plugins, get your mitts on Computer Music issue 210, which is on sale now. The EMT 250 is not only a classic digital processor with reverb, modulation and delay effects, it's also designed for quadraphonic - four-channel - use. Rather usefully, the UAD version can be switched between Front (main) and Rear outputs. If you're already planning to use the EMT 250, it's always worth checking these out, as the effect is usually different. Things you'll find with the Rear outputs: the Space reverb has more depth, the Chorus mode sounds narrower and more upfront, the Delay effect is summed to mono, the Echo wet signal is muted, the Phaser effect is wider, and the main Reverb stereo image is reversed. All good stuff to know! EQing electric guitars - particularly overdriven ones - can be a frustrating business. However, the minimal phase shift design of the Maag EQ is ideally suited to the task. Use the 2.5kHz shelving band to cut or boost the mid-range edge, the 650Hz bell-shape band to adjust thickness, and the 160Hz bell for weight. Use the output Level Trim if necessary. Remember, the bands offer +15dB boost and -4.5 dB cut, which is not obvious from the '+/-5' labelling. Dub delays work by feeding an EQed delay signal back into the delay input, causing it to endlessly filter the repeats. With UAD's Echoplex EP-34 tape delay emulation, it's achieved using the Echo Repeats (feedback) level and Echo Tone (treble and bass) controls. Insert the EP-34 on an auxiliary with a synced 1/8D delay, then deactivate Sync. Use automation to send snippets of audio to it, then, once you've found the feedback sweet spot, 'ride' the feedback and tone controls in real time, recording the moves as DAW automation. Other things to try on the EP-34 include 'riding' the delay time (which can turn into a performance in itself) and adjusting input level (Recording Volume). The Cooper Time Cube is a gem of a processor with twin delays of up to 2.5 seconds. However, it's the small spaces we love the most in this unit. Head straight for the preset folder, where you'll find examples such as Guitar Spread, Vocal Dimension and Added Space, and the slightly larger Bright Room and Live Stage. All offer varying degrees of width-enhancing space, working very well on an auxiliary. If the tonality isn't quite right, the Bass, Treble (and, to some degree, the Color and Coils settings) can give you further control over the sound. Getting vocals to sit in a busy mix can be challenging. If regular EQ and compression won't cut it, the SPL TwinTube - which emulates the classic hardware of the same name - could save the day by adding additional harmonics to liven up the signal. Head straight to the Harmonics option on the TwinTube and try the 2, 3 or 6kHz setting for male vocals, and the 6 or 10kHz setting for female vocals. Be bold with the Harmonics level control. Now, tweak the Saturation control, aiming for subtle signal limiting and a little harmonic distortion. As UAD has developed, DSP usage has drifted upwards. One reason for this is the modelling of more of the original components, as emulation increasingly focuses on circuitry such as input/output transformers, valve or transistor amplification stages, and the associated distortions that accompany them. You'll often hear pro engineers talk about inserting a processor simply to add character without actually using any of its processing. This technique is now much more of a reality for UAD users, and all three of the recent 'Collections' - Pultec Passive EQ, LA-2A Classic Audio Leveler and 1176 Classic Limiter - are good starting points. Load them up, set their thresholds to maximum or gains to zero, and let them do their thing. The Little Labs IBP is a problem-solving tool that, when used correctly, can reduce comb filtering when combining related sounds such as mic and DI, or a multi-miked guitar cab or drum kit. Its two modes enable signal delay (0-4 ms) and signal phase rotation without delay, and can be used at the same time. The second option helps retain the timing relationship but can improve the overall coherency of the combined sound. To make use of both features, load the plugin on whichever track has the earlier timing (typically the DI in a DI-plus-mic situation). For phase adjustment of bass guitar, select the range (90 or 180) and amount to taste, and tweak the Phase Center Lo/Hi setting to see which works best. One final alternative is to seek out the phase setting that delivers the thinnest sound and, when you've dialled it in, use the Phase Invert button to switch the phase through 180 degrees. You should now get a thick, fat sound. 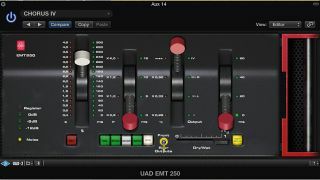 If you're not a UAD user, the advice and techniques we've offered here are still very much applicable outside the realm of Powered Plugins. Many of the processors we've used are emulated as native plugins too, or can be approximated using plugins you already own. Ultimately, the general concepts of classic mixing can be applied no matter what plugins you own.